As the days begin to become longer, and the sun gets closer, the walleye start to move out of the deep pockets, and into river systems to spawn. Walleye will will travel as far as they can before they start to lay. 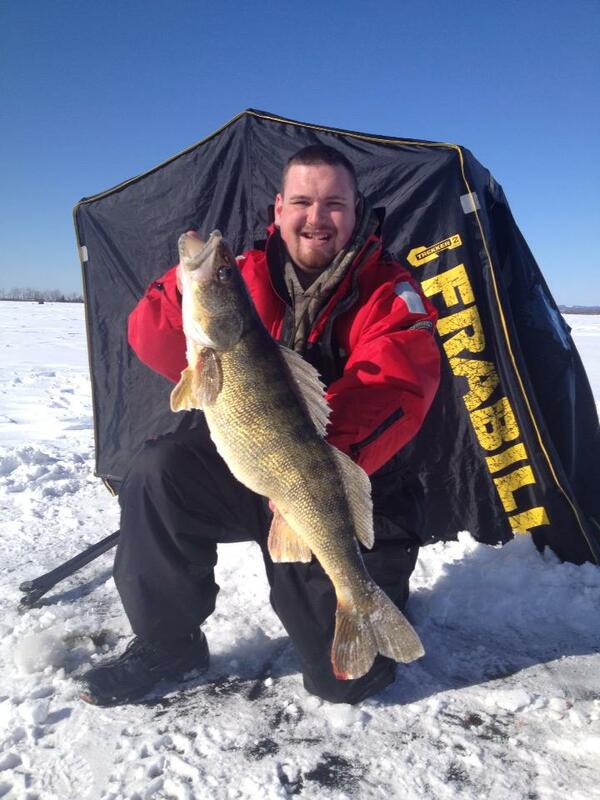 This means you will find large populations of pre-spawn walleye near dams and boat canals. During the early winter months, the big fish will come into bays and feed in the morning, go back out deeper, and then repeat in the evening. they will not enter the river systems, but they will stay very close to the tributary's for when that water meets the ideal spawning temperature. Finding fish through the ice the last few weeks of the season is much easier than you may think, if you keep these facts in mind. As the walleye start to move out of the lakes and bays, they make their way into the river systems. Parking yourself right at the mouth of a river or stream will give you the chance to cut those river running fish off. Walleye on the run to spawn are on a mission, they are in a race against time. This means they will not be cruising in and out of shallow bays to eat, they will be migrating in schools up the channels and picking up what they can on their way through. Keep in mind that many of the fish running the river have come a very long way to get to their spawning grounds, using a slow presentation will help trigger a strike from these tired fish. Using a flashy spoon or a fish mimicking lure, tipped with live bait is the best choice when targeting these fish. Walleye being a very tasty fish, they are usually kept for the table. This time of year, I encourage the release of the bigger sows. An article written by The Department of Fisheries and Oceans Canada explained that: Conventional wisdom shows that it is better to harvest the larger fish and to let the young, smaller fish go. It is believed that this allows the younger fish to grow more easily in an environment where there is less competition for available resources. However, things are not always as they appear! Several researchers have shown that older, and often larger, fish play an important role in the health of a population: due to their larger size, they produce not only more eggs, but also eggs of better quality with higher chances of survival. An organization in Texas has done studies on Trophy bass caught in the bassmaster series, and have proved that not only do the larger fish produce a better strain of eggs, but also a strain that will grow into larger, trophy fish themselves. This is great for the growth of the fishery. And remember* Every day is a great day for fishing. Thank you to Department of Fisheries and Oceans Canada and Eastern Ontario Outdoors Team Member Kane Logan for some of the knowledge they gave to assist me in this article.